If you thought Timor Leste was off the beaten track, take a boat ride to the island just an hour or so offshore from the capital, Dili – to Atauro. You will find a place where living with nature is as important as your holiday, and where you can almost feel the spirit of nature. By Jeremy Torr. Singapore, March 12 2018. “The functionality, simplicity, serenity and calming ambience of our humble lodge was built from collective ideas through like-minded people,” says Barry Hinton, the man who founded Barry’s Place on Atauro, Timor Leste. Atauro is as unspoilt as it gets - and the people value that. Courtesy Barrys. Despite the relative remoteness Barry seems to have hit the spot with plenty of like-minded people; although he is not able to take web bookings due to the lack of always-on connectivity, he is consistently rated above average by visitors. Barry first visited the island way back in 2001, as a volunteer teacher and community development worker. Despite some difficult times in his early years there – it was a very tight knit community then – he fell in love with both the place and the people, and decided to settle down to build a visitor’s lodge that would, as he says, “care for the earth as well as care for the people” who lived there. In our opinion, he has succeeded. Despite its remoteness, getting to Atauro is not that hard. You first have to get to Dili; then you can catch a boat or local ferry, or even charter a plane from the Mission Aviation Fellowship and land on a dirt airstrip. Either way, as there are virtually no roads on Atauro, so you won’t end up far from Barry’s, on the beach near Beloi. 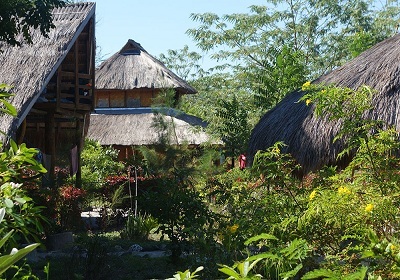 All the cabins on Atauro in Timor-Leste use local materials in their construction . . .
As the boats all moor up directly on the beach, you then walk straight into the lodge. Barry has built from scratch (with a lot of help from local craftsmen) thatch-roof cabins in double-storey family, twin bed or double bed versions. All are built with local conditions and materials in mind. Bamboo, palm leaf and local woods make up most of the structures, which come powered by solar panels for the basic lighting and cooling fan requirements. The design is such that even in hot and stuffy weather the breeze through the open structure will keep you cool. Luckily, mosquito nets keep the less-welcome bits of nature out at night. The whole lodge is built the same open way; you feel like you are in an African native village – the sound of the sea, the smell of the beach and the buzz of wildlife are all right there with you in your room, in the dining area, even in the toilets! The food (part of the package) is all locally sourced too, and fresh as can be. And although he has a phone, Barry doesn’t supply internet. It’s really quite pleasant not to be connected. 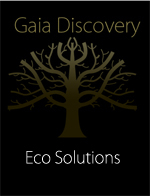 Barry and his wife Lina say they chose permaculture as a design philosophy to complement the key aim of the lodge as a true eco-tourism destination. He says the objective is to “create a system that is both ecologically sound and economically viable.” He says this allows the lodge to provide for its own needs, but does not exploit or pollute - and is therefore sustainable in the long term. “We are working with, rather than against nature,” he says. Take a walk up the road – or a bike or a hitch in a passing tuk-tuk – to Vila Maumeta, the main settlement on the island which has a Post Office and a few shops and eateries. There you can drop into the Bonecas de Atauro doll workshop. The Bonecas co-op was founded several years ago to help local women learn a viable living by making traditional fabric dolls. These charming little figures are made by hand in dozens rather than hundreds, then either exported or sold to tourists. Every one is individual. The sight of elegant local women chatting and treadling as they make the dolls one at a time is wonderful, and they are happy for visitors to wander round inside before you buy a doll. If you are on Atauro, make sure you visit. Other things to do while on the island are a bit like Barry’s – not your average ‘tourist’ entertainment. You can rent a local canoe, and snorkel around the amazingly colourful reefs a short way offshore. You can hike to the top of Mount Manukoko, or you can catch a local boat round the coast to marvel at the virtually unexplored beaches and cliffs. If you want parlours, bars, entertainment and musak you are well out of luck. Live with nature - like the Ataurans. Photo J.Torr. But that is the thing that draws most visitors to Atauro. As Barry explains, his lodge is built on the basis of living sustainably, frugally, yet comfortably with Mother Nature. He says that is just one reason – apart from the view – for re-vegetating with native species, minimising excavation and reducing disturbance to ground cover at the lodge.